Can you make a Google Script for me that compares two strings character by character? If differences are found, the script should point these out. If no differences are found at all, the script should put out the text "[ id. ]" . I have two columns containing lists of horizontally identical, but sometimes almost identical text strings. This is on purpose. Each row has another couple of words that need to be compared. If you compare these two, you’ll see that cell B2 has ‘K’ where A2 reads ‘C’. My envisioned formula would then populate cell C2 with: "[ – – K – – ]"
As far as I can tell, I’d need a Google Script that parses both strings character by character and output "–" when they are identical, and output the value of the character string from B2. 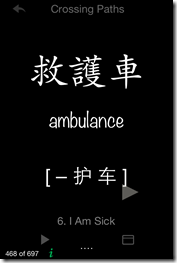 It should be relative simple, with a FOR loop. Thing is, I’ve never written a Google Script, and it’s a bit daunting for me to start on my own. 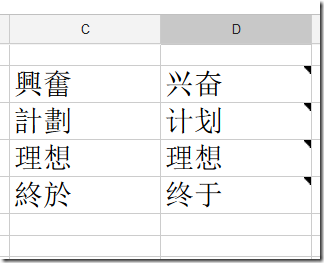 In case you’re interested in the actual use case: I want to use this formula to compare strings of Chinese characters, where the first column contains the traditional writing of these characters (typically requiring more strokes) and the second column containing the simplified writing of those same characters. Sometimes the characters are different, sometimes they are not. You can see this clearly in the screenshot below. The Google Spreadsheet is used as input for a flashcard deck I’m building, using the iPhone app Flashcard Deluxe (top-notch system, highly flexible) [also available for Android]. There’s no need to use Chinese characters to test the formula, I’m just providing this so that you know in what context the formula will be used. One of the things to be aware of is Google Apps Script formulas are associated with a spreadsheet. You can’t globally use a custom formula unless the script is attached. Fortunately when copying a spreadsheet you also get a copy of the script, so providing templates is a way around this. My rough workings are embeded below. You can also make a copy of the entire project including the Apps Script solution here. "[ " & CONCATenate(ARRAYFORMULA(if(mid(A31, row(indirect("x1:x"≤n(A31))) ,1)=mid(B31,row(indirect("x1:x"≤n(A31))),1)," – "," "&mid(B31,row(indirect("x1:x"≤n(A31)))&" ",1) ))) &" ]"
As you will see from the comments thread on that post Marjolein was having problems using my version with a Chinese characterset. Adding this to the example spreadsheet I’m unable to replicate the error but have encountered the problem here. If anyone can spot the difference I’d welcome your thoughts?